The Town of Whitewater is a thriving rural community with a population of 1486 in the Kettle Moraine Area of Southern Wisconsin with scenic farms, public state parks and recreational lake areas. This area has something for every outdoor enthusiast. 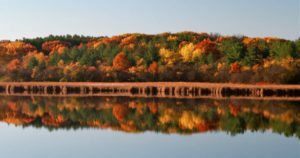 The beautiful Whitewater and Rice Lakes at the tip of the Kettle Moraine state forest provide boating, swimming and fishing. Hiking, biking, skiing, snowmobile and horse trails abound in a glacier carved setting of rolling hills and forests. Local DNR campgrounds have wooded sites for families as well as for large groups. Just to the north, the nearby City of Whitewater offers convenient shopping, restaurants, medical facilities, and the University of Wisconsin-Whitewater with its wide range of cultural and sports activities. Junk televisions WILL NOT be picked up in your weekly garbage collection. New starting in 2019: Televisions and electronics collections are now included in your annual garbage/recycling fee. You must call John's Disposal at 262-473-4700 to schedule a bulk collection for your television or other electronics item. For safety and assistance for the safety patrol, it would be helpful if all lake properties posted their fire / address number on the lakeside of their property near their dock. © 2019 Town of Whitewater. All Rights Reserved.